The Nerdie NASCAR System is a 3-conductor race communcation system designed by a racer for racers, just add your radios. As an added bonus, a free pair of stereo earbuds while supplies last. That's all the necessary wiring for the car and driver for only $150.00! Up to 5 additonal helmet kits for $25.00 each. This system has been developed through 8 seasons of endurance races up to 24 hours. In the fall 2011, after struggling with our own communication system and inquiries from other racers looking for affordable, effective in-car commincations the orignal Nerdie NASCAR System was developed. The 2015 Nerdie NASCAR System is a new evoltuion of the orignal system improving on the features with a larger inline PTT and longer PTT and helmet leads now 6' past the inline PTT. 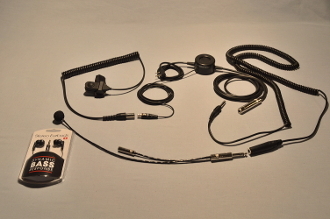 In order to play more nicely with the other race comms, the 2015 Nerdie NASCAR System uses a mini/tiny-XLR connection for the PTT and the PTT has a coil cord. The staple of this system is the Nerdie NASCAR Helmet kit which is handmade here in the USA. The Nerdie NASCAR Helmet kit is made with high quality, all metal, Rean connectors and heavy gauge fully shielded wiring. The 2015 Nerdie NASCAR Car Harness features a larger inline PTT allowing room to offer an optional 3.5mm auxilary jack which can feed communication audio to a GoPro. While the new system is longer, it still includes a coiled extension cord, now from Hosa, to run between the harness and driver providing much better driver flexibility as well and preventing shock loads to the main harness. If for some reason the coil cord fails, the harnesss can easily be plugged into directly as a form of back-up redundancy. Spotter headsets are recommended for improved paddock communication. Just add your choice of radios to complete the pacakge.